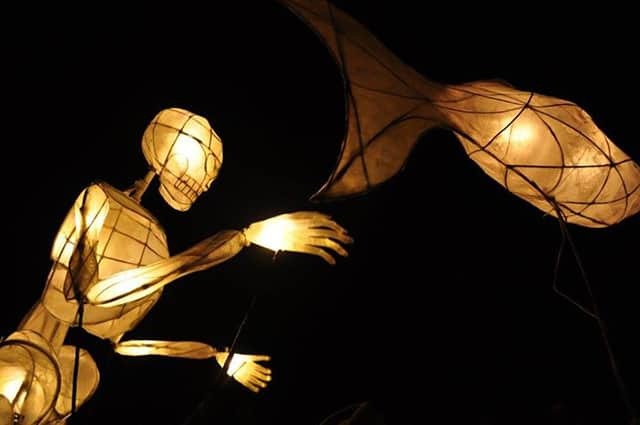 On the night of October 31 2015, over 600 people gathered on the riverside outside Ocky Whites, their lit lanterns bobbing, in the shadows of the castle above, as an 11ft skeleton puppet emerged from behind the river side tower and made its way across the bridge to meet the crowds. An absolutely amazing evening, we were blown away by how lovely it was. It was just lovely everyone getting together to achieve something so wonderful. More of this is what Haverfordwest needs! I can’t believe how many people came along. I don’t think I’ve ever seen anything this beautiful before. My children were so chuffed to be carrying lanterns they made themselves. This was definitely a night we will never forget! The ‘magical’ River of Lights procession was the culmination of hours of work and enjoyment of at least 500 local people at the lantern-making workshops run in collaboration with Span Arts Cheerful Project and kinetic artist Toby Downing. Following training from Toby, staff and volunteers from the Lab and the Cheerful Project were able to go out and and share their skills with local communities in Haverfordwest, Clarbeston Road, Maenclochog and Narbeth through a series of free drop-in workshops over the course of the October half-term. During these workshops, people of all ages were able to make their own lanterns using sticks of willow, tissue paper and PVA glue. Great! Great! Great! I loved it, Great! Thanks, Great! A little event in itself! Nice cuppa. Let’s make more things like this happen. The Lab also worked with Spittal primary school and Garth youth club, as well as hosting sessions with artists, including Art and Design students from Pembrokeshire College. During these ‘Makers’ sessions’, students and artists were able to experiment with the materials and create the fish lanterns which marked the parade trail at the Frolic.